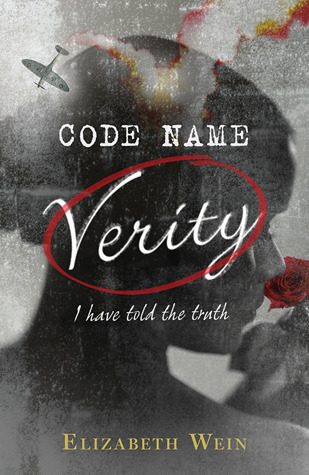 Code Name Verity is a deceptive book. It presents itself as just another World War II story at the beginning, but it slowly transforms into a heart-wrenching punch to the stomach that you'll never forget. It's the kind of book you'll want to re-read to catch all the details, but you also won't need to because the story will be permanently etched in your mind. The book is not easy to get into. It's not exactly a bumpy start, because the road is clear and straight, but the reader can't see that until later on in the story. Code Name Verity is told in two parts. The first part is told by Verity (a code name for our protagonist). She's been captured by the Gestapo and is collaborating with them. But she doesn't just write down her secrets at once. Rather, it's a story that goes back to the creation of a friendship between an ambitious yet poor girl who wishes to be a pilot and a wealthy, snooty girl who works in codes. Our narrator is the snooty girl and Maddie is pilot. We soon learn that there is much more to these characters than Verity initially reveals. (We do learn Verity, aka Queenie's, real name, but I'll let you discover it). Verity's story feels stand-offish at first. Not only does she ramble about things that seem to have no relevance, but she's made Maddie the central character of her "confession" and refers to herself in the third person. But be patient. Every word is important to the plot and Verity's demeanor in her writing is just as relevant as the substance. I admire Ms. Wein for daring to present the reader with such a difficult beginning. For trusting us to appreciate the subtleties. Just when you're most invested in Verity's story and terrified for her future, the narrative switches to Maddie. Her story is told in a standard first person, current events tense. She is hiding in France and desperate to perform her mission as well as save Verity. And that's all the plot details you'll get from me. Any more would ruin the story. I love both Verity and Maddie. We see Verity at her most desperate - scared and angry. Yet she has a subtle dignity, a witty sense of humor, and calculating nature. Maddie in some ways comes off as a stereotypical girl - hesitant and fearful. But she also is incredibly brave, ambitious, and full of brute determinism. Maddie is the girl that I would be friends with. Verity is the girl I would look up to. There are a few side characters in the story, but the one who sticks with me most is Von Linden. He is the Gestapo officer who interrogates Verity. He is a gray figure. He subjects Verity and her fellow prisoners to unimaginable torture. Yet he is a father, an intellectual, and appreciates Verity's writing as much for the story itself as for her secrets. It's as if Von Linden is at war with the monster inside himself. The monster is winning, but the man beneath peeks out. It was nice to see the "enemy" presented as a human being - not in a way that makes you forgive his crimes but in a way that makes you realize that people not that different from you and me are capable of horrible things. Verity's story is the most significant part of the book, but Maddie's story moves faster. Their tales merge unforgettably. I finished the story crying bittersweet tears, but with the excited buzz that I only get from books that wrap themselves together completely, surprisingly, and subtly. You must read Code Name Verity if (1) you love historical fiction; (2) you love full-fledged main and side characters; (3) if you like to cry; (4) if you like books that start out as a scattered 2,000 piece jigsaw puzzle but come together to present an amazing picture. I just started reading this today and I'm enjoying it, but I was just wondering where exactly the story was going and so now I am super intrigued that you say there's so much more there... Ack, I hope I didn't miss some important details already! Maybe I will end up having to reread the beginning. Anyways, I am so happy you thought so highly of this one, Alison! Makes me very motivated to read on. This book is so amazing, isn't it? I'm giving it to some of my friends for Christmas so they can finally get what I've been talking about for all these months! I've heard so many great things about this one, but I've also heard it is really sad. I want to read it, but I'm a little hesitant. I think I may be the few people who didn't cry in this book and I'm wondering if the slow, jargon filled portion of Verity's part is what kept me removed. Other than that I enjoyed it. Wow, a 5! A rare rating from you, so that means this book cannot be missed. I love that the "enemy" is very very human, I think those types of characters are all the more terrifying and fascinating than any paranormal villain could ever be. I snagged a copy of this at BEA but have been putting it off. I need to stop doing that clearly:) Stunning review Alison! "It presents itself as just another World War II story at the beginning, but it slowly transforms into a heart-wrenching punch to the stomach that you'll never forget." - I completely agree with this statement! I gave up on this story in the beginning and picked it up again at a later date, and I was so surprised by how intense and emotional this story turned out to be by the end. I ADORED this book. It was so sad and your review beautifully captures everything about this book. I really do think that everybody should read this because you are so right about the deception. It punches you in the stomach with its raw emotion. Awesome review! I'm going to have to read this book soon. You make it sounds awesome! I do *not* like to cry but I've heard so many good things about this book, I feel like I need to check it out. I'll have to see if our new library has it (and tell them to order it, if they don't! It should definitely be in a HS library, sounds like). Everyone loved this book so much I almost feel like I have to wait for the hype and reviews to die down a little before I pick it up. I'm afraid my expectations will be too high but it sounds absolutely amazing. My mother in law read my copy already and loved it. Wonderfully reviewed! I like how you presented everything. I'm always afraid people will stop at the beginning and decide not to push onward. You make a good case for why they should keep reading. "It's the kind of book you'll want to re-read to catch all the details, but you also won't need to because the story will be permanently etched in your mind."